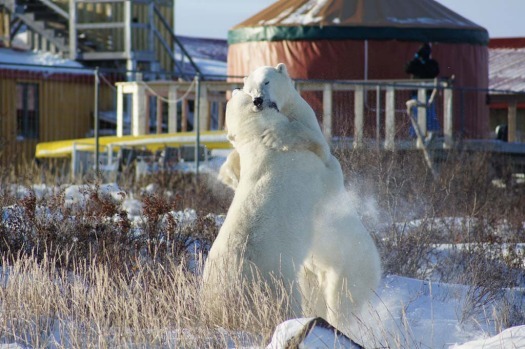 Polar bear sightings are guaranteed north of Churchill, just make sure they don't get too close, writes Craig Platt. We're on foot, in the open and defended only by Andy, a young Canadian armed with a shotgun and rocks. 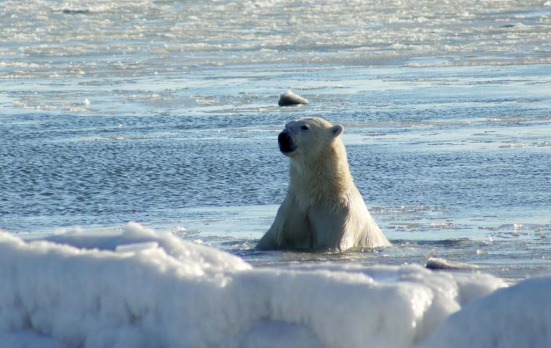 And with a 650-kilogram polar bear nearing us, what does Andy do? He opts for the rock. He lobs what is actually a small stone at the animal and it bounces off it. Fortunately, rather than making the bear angry, the beast is startled and runs, though only a few steps. Our small group nevertheless breathes a collective sigh of relief, having just discovered how quickly something can go from cute and cuddly to intimidating and terrifying. Digital travel editor Craig Platt comes face to face with the world's largest land predator on foot. The reporter travelled as a guest of the Canadian Tourism Commission. 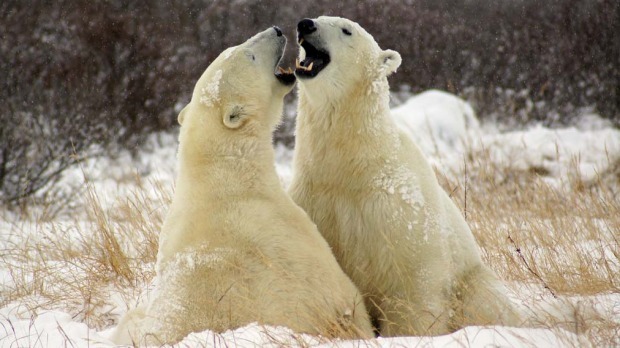 I'm at Seal River Heritage Lodge, a remote location north of Churchill on Canada's Hudson Bay, one of the surest locations in the world to view polar bears. 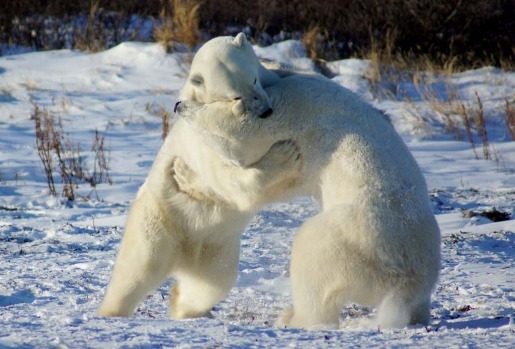 Just a few seconds ago, I'd been enjoying watching two play together in the wild, gently wrestling in a mock fight, occasionally collapsing on top of one another in a literal bear hug. But suddenly one became interested in our group and, from a distance of about 100 metres, had closed in to be just a stone's throw away (literally, as it eventuated). 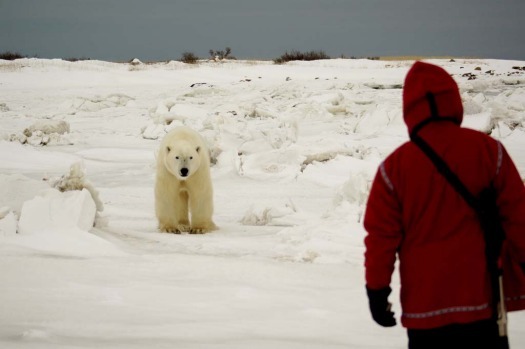 For many visitors to this part of the world and in contrast to my group, polar bear-watching means heading out on board the Tundra Buggy, a huge train-like vehicle that traverses the Arctic in search of the animals. 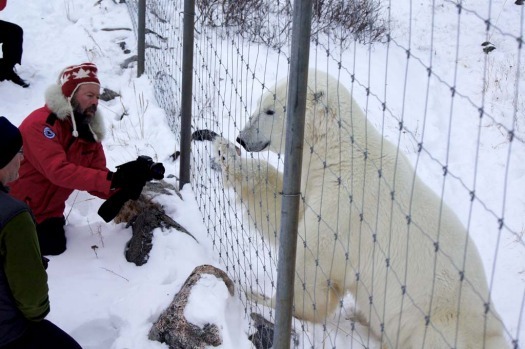 But at Seal River Heritage Lodge, one of four owned by adventure provider Churchill Wild, there is an opportunity for a close encounter with polar bears in the habitat sans a vehicle, cage or even a pane of glass, protected by a guide with a rifle and a rock. Earlier we'd witnessed a "level two" action to scare off a bear. The guides have several measures they can take when a bear displays too much interest. The first is banging the rocks together to make noise, the last resort is using that shotgun. 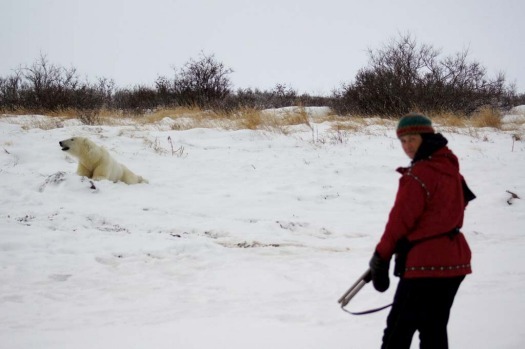 But our guides are very good at judging a bear's behaviour and assure us they've never had to fire a warning shot. 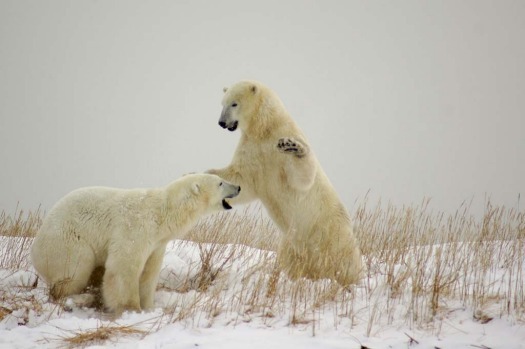 There are an estimated 20,000 to 25,000 polar bears left in the wild, with about 60 per cent of them located in Canada. 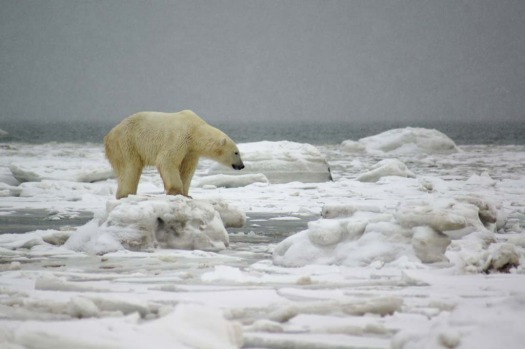 With the sea ice taking longer to freeze each year as a result of climate change, polar bears have less time and territory in which to hunt each season. Sadly, this is a species in decline and one that was, in 2008, listed as threatened. 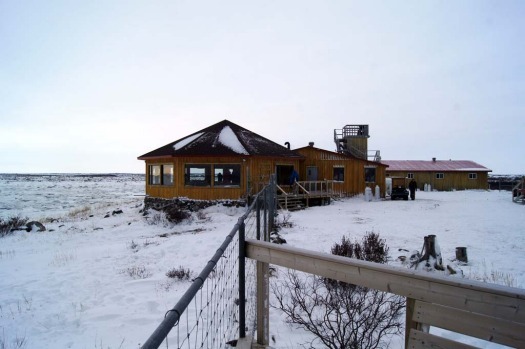 Seal River Heritage Lodge - accessible only by air except in April, when a tractor train delivers heavy supplies over the sea ice - has been built piece by piece and slowly expanded since opening in 1994. The family-owned lodge is run by Mike and Jeanne Reimer but three generations are present: the couple's children taking on various duties including running the kitchen while Jeanne's father, Doug Webber, who started the business, flies deliveries with his own plane. 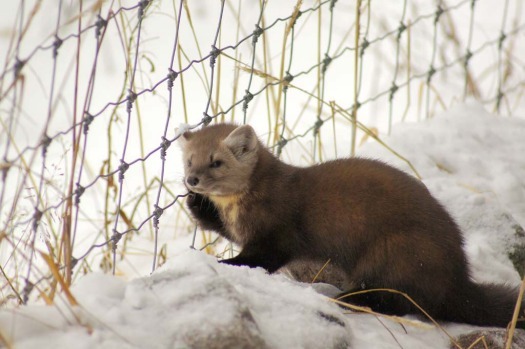 The lodge is able to accommodate 16 guests and offers a comfortable - and warm - environment to enjoy the local wildlife. And despite the harsh conditions, there is plenty of wildlife. The brochures feature photos of bears peering in at guests through the lodge's windows and fences, almost close enough to touch. Upon arrival we make a short walk from the airstrip to the lodge, and before we've even reached the front door we've passed two polar bears, which can be three metres long. At the back of the building is a fenced compound with viewing platforms, and we dash out after arriving for a closer look at the animals. 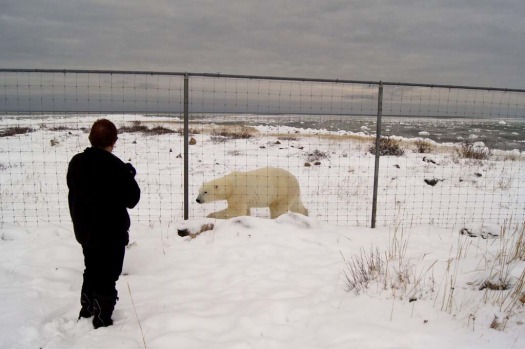 One comes to the fence and I'm advised to back away a little as the bear stands on its hind legs, well over two metres tall, to get a good look at me. 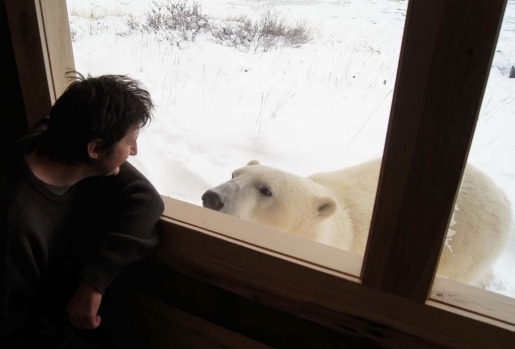 The lodge has made efforts to make itself polar-bear proof, as the bears are insatiably curious. It's not unlike staying in a zoo, except that here we are the ones in the cage. 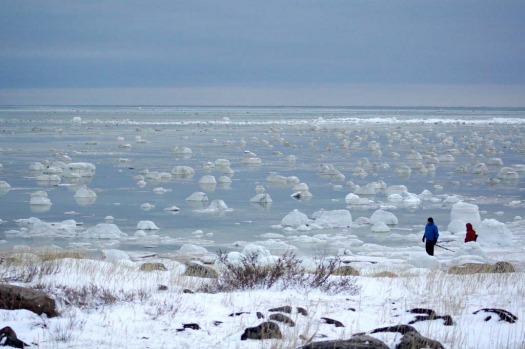 Apart from eating and sleeping indoors, we spend much of our time out in the wild, either hiking to nearby sights such as a frozen lake or Hudson Bay, or cautiously following the polar bears. The surrounding tundra landscape is bleak and flat, yet beautiful. Snow covers the ground and there are no trees to be seen, just the occasional large bush. 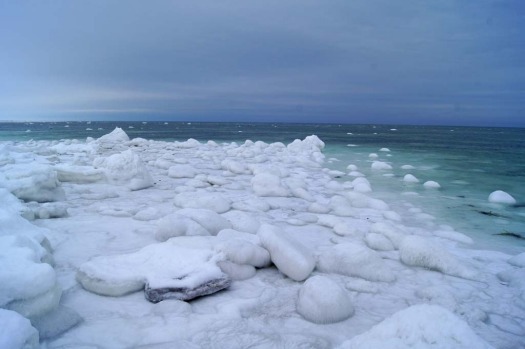 Boulders are strewn along the edge of an ice-blue bay. This particular trip is a "photo safari" and I'm sharing a room with two professional photographers, both of whom are on repeat visits. It's below freezing most days and the wind chill can make it even worse, howling across the landscape with nothing to slow its progress. And while it's no colder than your average ski field, we're relatively inactive when we approach the bears, with the cold biting quickly - my fingers, toes and face are numb after about half an hour. Back inside the lodge, however, we're treated to a welcome roaring fire and hot drinks. Despite the remoteness of the lodge and the challenges presented in supplying it, our meals are hearty and delicious. Bread is baked onsite daily and we're served stews, pancakes and the best sausages I've tasted. We're fortunate to see four bears during our stay, one of which has been a resident of the area for most of the season. The young adult male has been nicknamed "Hollywood Bob" by the residents, thanks to his tendency to constantly perform for the cameras. 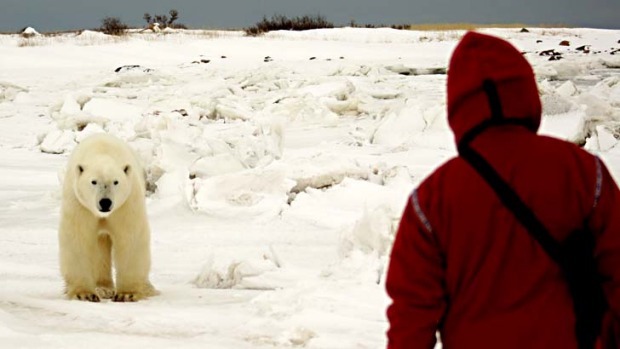 During our visit, Bob regularly approaches the lodge for a close-up look at its inhabitants, rolls about in the snow like an enormous puppy, or takes a dip in the bay. For much of our visit, Bob is joined by other young male nicknamed Scarface (for obvious reasons). 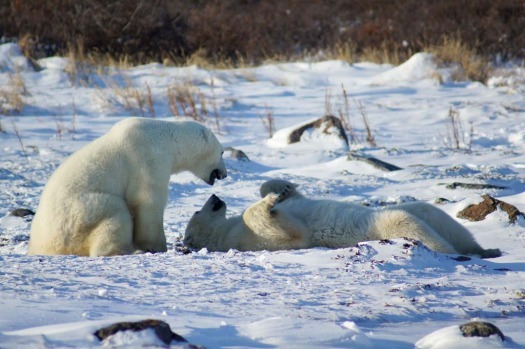 For several days the pair spends much of the time play-fighting, pushing and grappling. On the day we leave Seal River Heritage Lodge Scarface has moved on but Hollywood Bob continues his antics. 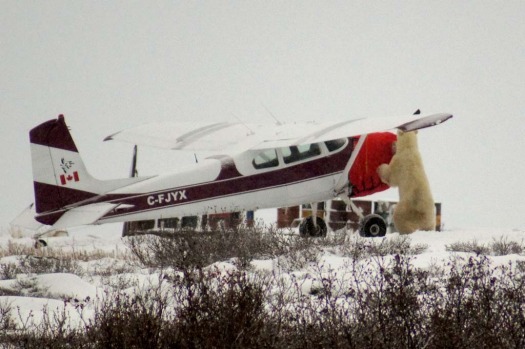 As we wait for the plane to arrive to return us to Churchill, Bob seemingly decides he wouldn't mind taking a flight himself. 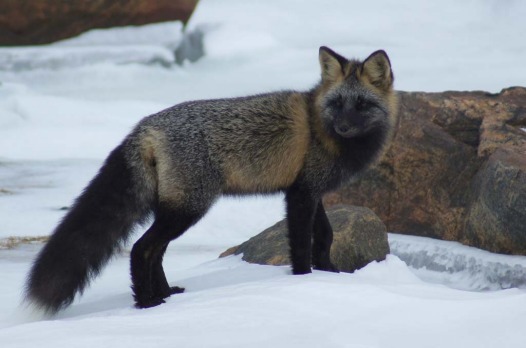 As we watch from a short distance away, he approaches the lodge's plane and proceeds to climb on it, pressing down on the tail with his forelegs. He then moves to the cockpit and rears up for a look inside. At this point, guide Andy becomes concerned that the plane will be damaged. "Bob! Hey Bob!" he yells in an attempt to distract the bear away from its latest toy. It doesn't work, so, still some distance away, Andy resorts to a "screamer" - a device, which as the name suggests, emits a loud screeching noise. It's sufficient to scare Bob off the plane. But, in a repeat of his behaviour earlier in our visit, he merely walks a short distance before stopping and looking back. It's clear he knows that here in the wild, he's the top of the food chain. Craig Platt travelled courtesy of the Canadian Tourism Commission. Air Canada has a fare to Winnipeg for about $2191 low-season return from Sydney including taxes. Fly non-stop to Vancouver (about 14hr) and then to Winnipeg (2hr 39min); Melbourne passengers pay about $200 more and fly Qantas to Sydney to connect. See aircanada.com. 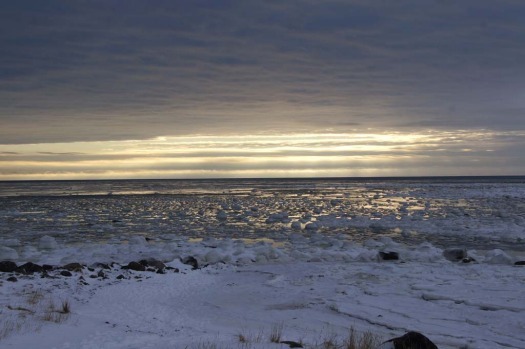 Seal River Heritage Lodge is open from July to November. 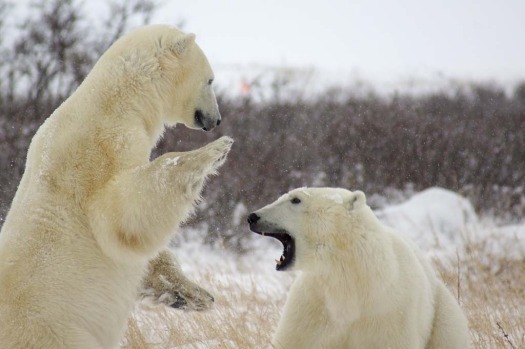 The six-night Polar Bear Photo Safari costs $C9395 ($9000) a person and includes flights from Winnipeg to Churchill and air transfers to Seal River Heritage Lodge, as well as meals. For full details and other packages, see churchillwild.com. 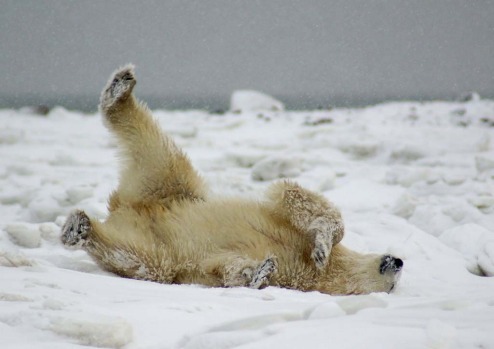 Estimated number of polar bears in the wild worldwide: 20,000-25,000. About 60 per cent of these live in Canada. 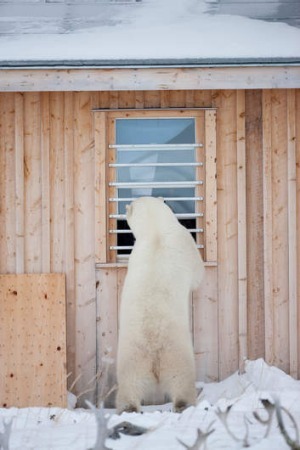 Polar bears are also found in the US (Alaska), Russia, Greenland and on Norway's Svalbard archipelago. Colour: Black. Yes, black. 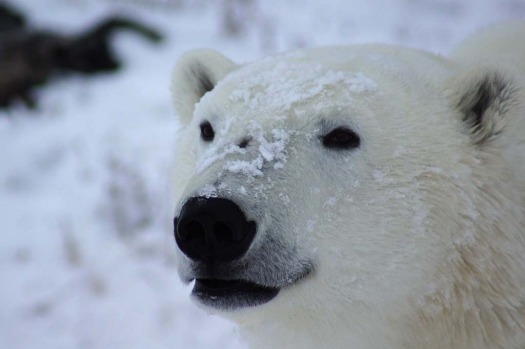 Polar bear fur is, in fact, transparent and only appears to be white. Underneath, the bears have a thick layer of black skin. 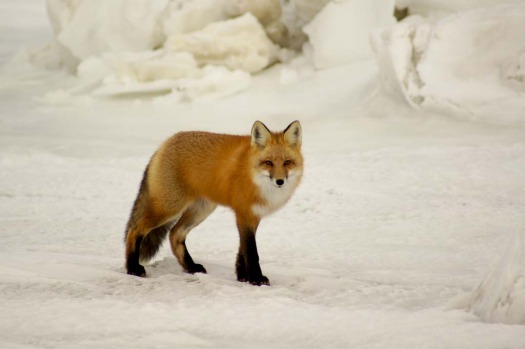 Habitat: The Arctic. 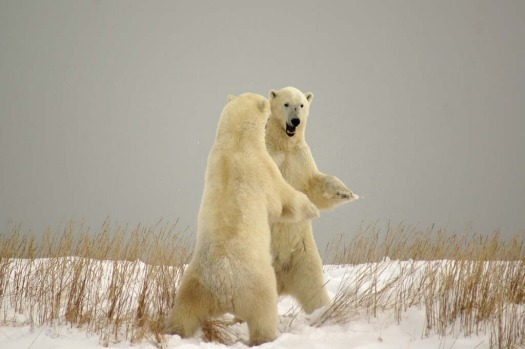 The word Arctic is derived from the Greek word for bear, while Antarctic means the opposite - 'without bear'.